The Tidewater Region AACA can trace its roots back to the mid 1950s, when the antique automobile hobby was just beginning in this area. About a half-dozen local old car enthusiasts frequently gathered at Thomas Moody's Mobil gas station on Virginia Beach Blvd. to work on their cars together and just chat about the hobby in general. The group had long been participating in events sponsored by the AACA, already 20 years old. In 1955, they decided to form the Tidewater Region. 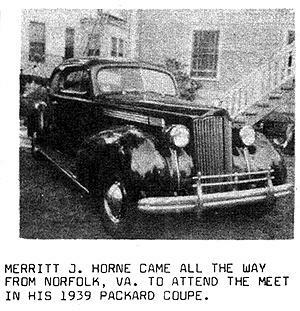 The charter was received in November of 1955, with Merritt Horne (whose 1939 Packard 120 Coupe is shown below at a 1968 AACA event) signing up in December of that year as the first 'new' member. Harrell Forrest joined soon afterwards. As a side note, Thomas Moody's 1931 Chevrolet and Merrits's 1924 Model T Ford are still in the club today. Over the years, Tidewater Region AACA has grown into a large and active organization with close to 200 members. We hosted our first AACA National Meet in 1976, and followed up with additional National Meets in 1984, 1996 and 2006. We hosted our fifth national Meet in 2016, and are looking at hosting a Grand National about 2022. Tidewater Region hosts an annual meet which is judged using AACA National guidelines. We also have monthly dinner meetings, as well as a variety of activities ranging from afternoon jaunts to antique shops or museums to weekend overnight tours on scenic back roads. Special activities have included a bus tour to the Biltmore, a boat ride to see dolphins, and a bus tour to Washington DC. The TRAACA is a family-oriented club that strives have events and activities for everyone. The TRAACA has become one of the most highly regarded regions in all of AACA. 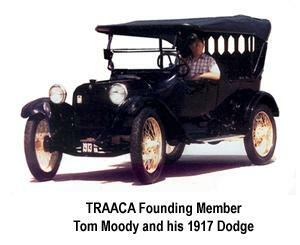 Take advantage of our rich and varied past by joining and becoming a part of TRAACA's future!